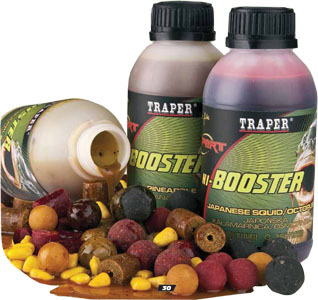 "Traper" Booster. Discounts Apply ! Professional concentrated liquid attractant was developed by "Traper" especially for a group of anglers that fish for carp the traditional methods: -fishing with a float or simply bottom fishing with an egg sinker. It draws carps to the feeding area. It produces excellent results when used as an enhancer for a groundbait or boilies. USE 30-60 ml per 1 kg of groundbait.